Making flavored “moonshine” in your slow cooker is so much fun! We have made several other yummy flavors in the past too and this one is so good! Just keep in mind that this is totally an adult only beverage because it contains some strong alcohol and of course we would like to remind all our readers to please drink responsibly! Additionally, I know that whenever we say these are moonshine recipes we always get comments from our readers that they are not really moonshine because we are not distilling moonshine in copper kettles in our backyards or something. You’re right, we are not. Instead these are flavored alcohol drinks where we infuse strong grain alcohol such as Everclear or vodka with juices, spices etc. And it’s OK because you know what…we are all adults here and these recipes are so GOOD! While we like to store our moonshine in canning jars for the full “hillbilly” effect you really can just store the flavored moonshine in any clean (sterilized is good too) bottle or jar too. You can even funnel it back into the Everclear or vodka bottles. There is no canning required for this recipe. The super high alcohol and sugar content prevents mold and bacteria from growing. You can store the jars of moonshine for up to 1 year in a cool dry location (like your pantry) and in fact the moonshine tastes better after it has sat for a couple of months. 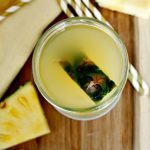 Serve this flavored moonshine recipe in shot glasses or mix with in cocktails for a refreshing pineapple sipping adult beverage. Add pineapple juice and sugar to a 5 quart or larger slow cooker. Cover and cook on LOW for 2 hours with the lid propped open slightly with a wooden spoon or similar. Turn slow cooker off and allow mixture to cool completely to room temperature. Add in Everclear alcohol (or vodka) and mix well. Ladle mixture into sterilized canning jars, placing canning jar lids and rings on jars until "finger tight"
You do not need to process the canning jars once sealed. Place the pineapple moonshine jars in a cool dry place and store for up to 1 year. The flavored moonshine tastes better the longer it sits. Do you happen to know how long this lasts for? the alcohol will keep it “shelf stable”. I have some apple pie moonshine that is over 4 years old. Still good! how long do you need to let it sit before consuming? I have made the Apple Pie one and that had to sit for a month. Please advise soonest as I would like to make this for a BBQ and need to know how much lead time I have. It is best to let it sit for 30 days. The alcohol will take on more of the pineapple flavor…but you can consume immediately if you like. How about a peach flavor? I had some real gorgia peach moonshine it was awesome! I have a really good peach recipe. This is something that I am going to make, sounds good. Do you have a recipe or idea for blueberry? Thank you for your time. I have been thinking about a blueberry one. Will work on it directly. Just got 3 quart bags of fresh blueberries given to me last week. Always add lemon with blueberry not a lot. Its à good balance. The recipe says to use four quart mason jars but I only filled three? I followed the directions exactly. Why is that? I made pints and I only got 6 which is equal to 3 quarts as well. I used this recipe as well and only got 3 quarts as well, the next batch I made I added a quart of water to the crock pot, let it cook for 2 hours. The taste is great and it will get the job done ? You can make this with fresh pineapple juice as well. Can you leave the fruit in it? Ex. 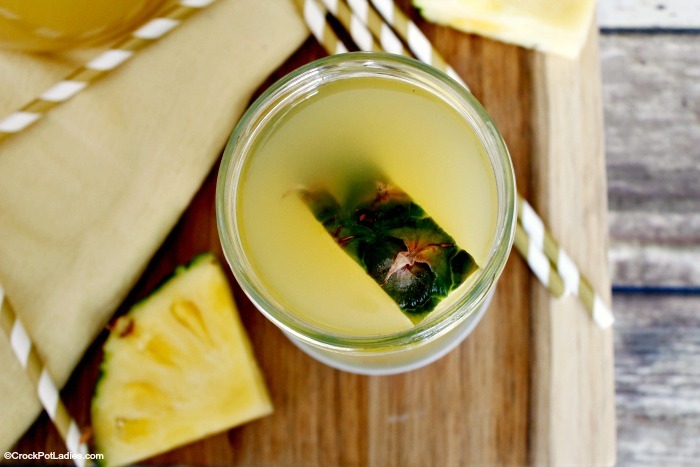 Pineapple Moon Shine w/ fruit or fruit skin in it when you put it into the mason jars. The fruit or fruit skin may go bad in the moonshine. Is the size of the canning jar a 4 Quart jar? thanks in advance, going to make some for my hubby. It is a quart jar. Really you can use any jar with a lid. I found only 46 oz cans of pineapple juice, is it one can or 56 ounces for the recipe? My can was 56oz. Get 2 cans, or you could use one 46oz can, and it would just be a little stronger. Hi, I want to make some out of muscandine grape cider. Would I use the same amounts. I would. just switch the pineapple juice for the muscandine juice. I made some pineapple moonshine and put chunks of pineapple in it.Will it be alright to leave them in it. Yes. I left a pineapple ring in mine and 4 months later, the pineapple was good and tasty. I did as recipe calls I only got two and one third qts. Sometimes more liquid will evaporate during the crock-pot stage. You could add in a little more juice, or just remember that your Pineapple Moonshine might be a little stronger. I have some berrie mix that I did for a drink. Strawberries,blueberries,rasberries and blackberries.The recipe called for you to blend then strain. Was standing for hours doing this. I was not going to throw any of it away. I put it in freezer bags in the freezer to keep.The pineapple was so good I was wondering if you had a recipe that I could use this mix for? Not sure about how much suger and berrie mix to use in the crock pot. Would be wonderful if you had any ideas? If it is a pulp, I would add in either apple juice or pineapple juice then cook it in the crock-pot for the same time as the Pineapple Moonshine. Cool the mixture, add the liquor and put in jars with lids. It would come out like tropical drink! Sounds good a little less sugar for me. Natural flavors. Thank you. That is just juice sediment. Shake it up before drinking! Wondering, when you put the liquid in the mason jars and close them up with the lids and rings. Do you have to have the lids seal the jars? Vacuum seal the jars. This was amazing. AMAZING! I used agave sweetener instead of sugar and the results were awesome. Thank you for the recipe! Do the lids seal? Should I do a hot water bath after filling the jars or do I just screw the lids on and store them as is? The lids in this recipe are not sealed. 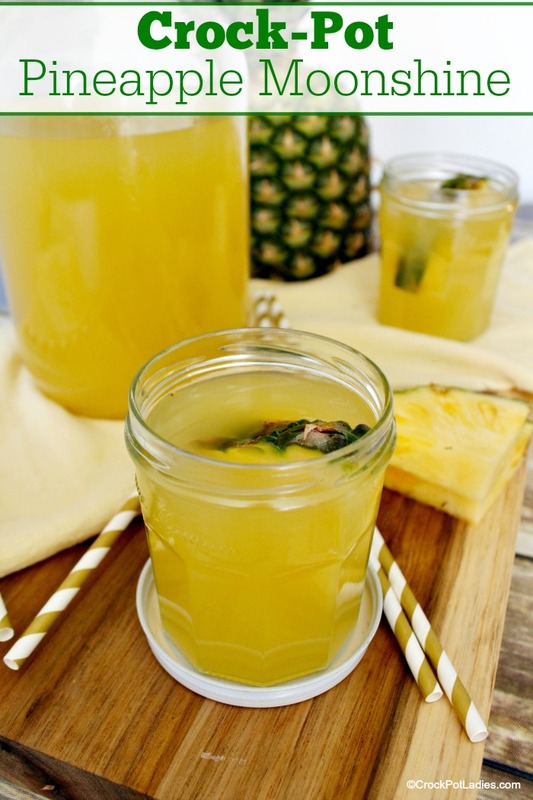 Because of the very high alcohol content in this Pineapple Moonshine recipe you do not need to water bath can the jars. Just make sure your jars and lids are sterilized, pour in the moonshine, screw the lids on tight and store just the way they are. Do you think it would work to add a few jalapeños to this, for a slightly spicy kick? If you like it spicy I would think you could add some jalapeños to the pineapple mix in the slow cooker but strain them out before putting into jars. Can this crock pot pineapple moonshine be stored in vine bottles with a cork?? Do you mean Wine Bottles Janice? If so, I don’t see why not. For how long do you store the jars? never mind I got my answer Thanks.